At this point it is getting a bit ridiculous how well Anathema is progressing, even 20 years after its inception. Certainly the British act is aging gracefully, to say the least. After starting out as a doom infused death metal band, Anathema has evolved into one of this generation's most prominent progressive/alternative rock outfits. That became obvious with 2010's excellent We're Here Because We're Here. Two years later, Anathema stun again with the absolutely marvelous Weather Systems. Weather Systems may come as a shock to those who fell in love with the band's last record. That isn't to say that they are drastically different musically, but rather, feature two very different tones. Where We're Here Because We're Here was a bold and explosive statement; a vivacious return after a seven year absence, Weather Systems is a quiet progression that actually feels much more comfortable. It's a much more introspective experience. Where the last record was music for music listeners, this album is music for music lovers; an album that needs to be experienced rather than heard. Simply put, this is Anathema at its most beautiful. Piano chords and swelling strings are commonplace, as are the wonderfully comforting vocals. As a whole, things are a bit softer this time around, with ballads and ambience filling a surprising amount of the record. However, there are plenty of rock and experimental moments as well. The diversity is incredible, but the package is extremely cohesive as well. The songs flow perfectly, and the tone is carried throughout the album's entierty. All in all, Weather Systems is a ridiculously well put together piece of music. 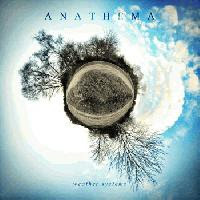 Anathema left for quite a tick, but then returned with its wonderful last record. Now, Weather System proves that they never really left us to begin with. This one comes highly recommended, kids.